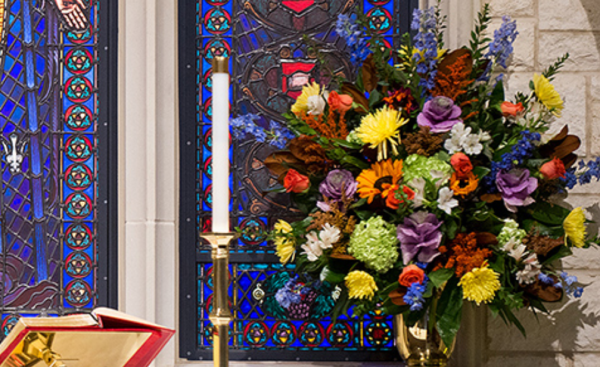 Flowers in our holy worship spaces are a beautiful gift to God and those who attend services at Saint Michael as well as those being honored or remembered. The cost of altar flowers is funded through generous donors to the Saint Michael and All Angels Flower Fund. A contribution to the Flower Fund is a meaningful way to honor or remember a loved one for special life events such as birthdays, anniversaries, baptisms, confirmations, thanksgivings, or in memory of a loved one. Your donation and commemoration will be noted in that Sunday’s bulletin. There are multiple opportunities to fund the flowers in either or both of the holy spaces at Saint Michael. In your selection, you will be able to indicate whether you would like to sponsor a single arrangement or both arrangements in a holy space.